If there’s one thing that I really enjoy, it’s riding trails that hours earlier had been used for a race – the scars of hundreds of tyres are still there, making it obvious what happened but the lack of any noise seems eerily out of place. When the scars are from a race that you helped create and they’re on your “own” local trails that you’ve messed about on for years. it’s even better. Last night I had a ride around the HTN Winter Sprinter course from Saturday. It was pretty muddy last night and nothing at all like the conditions during the race. It was however very, very quiet which was another contrast to Saturday, when we had almost a hundred riders who all seemed to be properly racing hard. Despite the recent snow, rain, hail and wind, we were due some luck with the weather after the washout/mudbath that was Hit the North 1. We got our luck in the form of prolonged sunshine on the day of the race and the day before and some very cold temperatures that froze the course almost solid. After the last couple of years of wet weather in the UK a frozen course is quite a novelty and no doubt encouraged almost everyone to put the hammer down. And hammer they did. We were able to set up the course pretty quickly on the day before the race, only using the signs and tape we actually needed instead of the million or so signs and 300 miles of tape we used back in July. 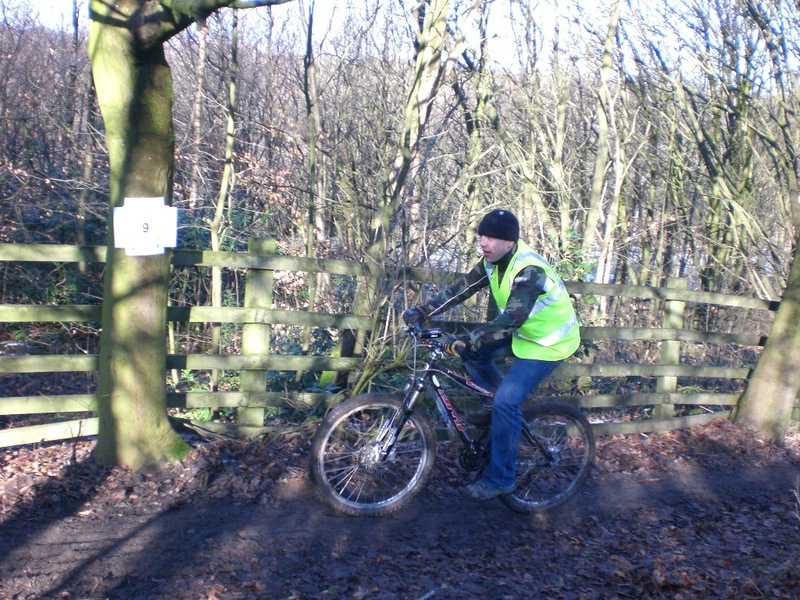 We were so frugal in fact that Paddy (the British Cycling Commissar) asked us to stick a few extra ones up at the far end of the course. At 10am (ish) the race started – we used a brass band as a starting pistol, which we thought worked rather well. Off they went (actually, some of them were bloody flying), an lead pack emerged very quickly. The eventual leader of the first lap, Ady Lawrence, would go on to take the win after maintaining (and extending) his lead throughout. 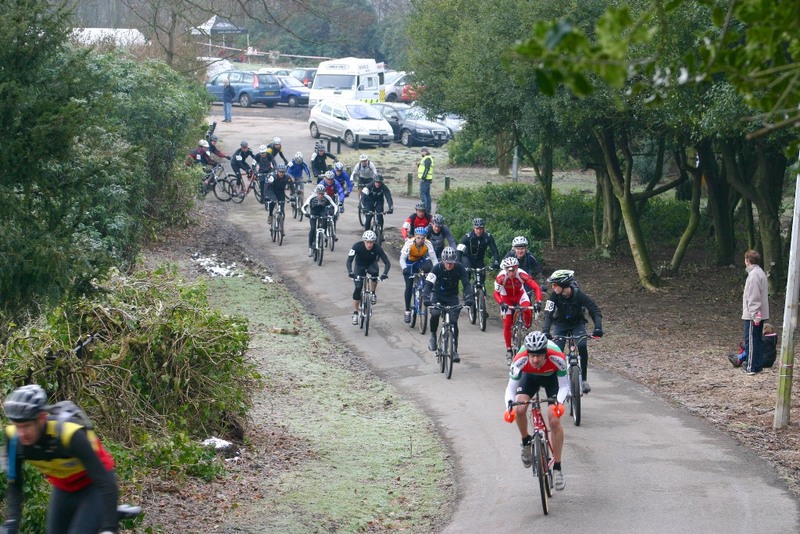 It was obvious that the course was popular – a good mix of fast tarmac climbs, techy, steep downhills, slippery off-camber rooty woodland bits and a big zig-zag section across the lovely manicured park lawn (oops). There’s not much else to say really – apart from the caterers selling all of their bacon butties, loads of people turning up to take photos (hi Chris! ), nobody crashing their brains out (apart from one lad who tried to snap a tree with his chin), the marshals all turned up and more importantly, didn’t wander off, the band played some brass band stuff, brant marshalled at the fishing pond and told everyone “5 minutes to go” when it was actually 20 (causing grown men to cry when they realised they had to do another lap – great anti-lurking measure though!) – nothing really happened apart from what was planned. Admittedly, a 2 hour race is a lot easier to manage than a 12 hour wet race with camping and a flooded field, but honestly, nothing serious took place. If we’d had bombhole-level carnage from the start like we did last time and visits from the police (like we had last time – ahem) then I’d have loads to write – but it was all as smooth as butter. Me and Andrew could easily have had time to race in fact (and next time we will). As it happened, I did my customary 2 “admin” laps. This time with a high-vis vest, walking boots, jeans and a beanie. I looked like your classic shift worker on his way home. I’ve seen a number of separate blog entries and articles about the race, linked below. To get a real idea of what the race was like from the perspective of someone who was actually taking part, read them. There’s also a load of photo galleries that I’ve linked from the Hit the North website. We’re already talking about the next race and the ones after that. We can do what we want with this, carve our own niche, but what we have learned this time is that the cyclocross/MTB crossover works, as do shorter races. We may do something “medium” sized next time. I’ve still got a few ideas for the course as there’s plenty of scope for adding in new bits and even opening up long-forgotten paths that will keep things fresh and add to the technical challenge. I stopped for a while at the top of the steep drop (now known as Rooley’s Chin) during my ride last night and thought about how cool it would be to race for 2 (or maybe a few more) hours at night….maybe with a mariachi band in the woods…the possibilities are pretty much endless. Fantasic Race, really well organised. I can’t wait for the next one.. Hurry up lads and get it organised!! Ey up . Check out the very recently uploaded HTN video. If you need to contact me you’ll have to go through my agent.